We fly in the early morning just after dawn. When we get to the launch field, the pilot and crew, lay out the balloon and cold inflate it, this is done by blowing cold air into the envelope (the huge colourful bag) with a powerfull fan. When the balloon is half full with cold air it is time to hot inflate, hot air from the burners is blown into the balloon and it stands up vertically, ready for flight! The setup and inflation takes about 30 minutes, and the flight approximately 1 hour depending on wind and weather conditions and may be varied at the pilots discretion. A balloon can not be steered; it drifts with the winds, so we may land in a big field, on a dirt track, or maybe in the grounds of a castle.. Part of the balloon flight magic is that you never know exactly where you may land. The pilot keeps a constant close watch on the weather patterns and prior to flight will consult weather briefings from several sources and the airport. With that knowledge it is determined where to set-up and in which general direction the flight will take. The winds at altitude usually travel in different layers and it is these layered winds that are used to navigate the balloon around the heavens.. Throughout the balloon flight the pilot is in radio contact with the chase vehicle and Air Traffic Control. After landing we load the balloon back onto the chase vehicles trailer which follows the balloon throughout the flight. 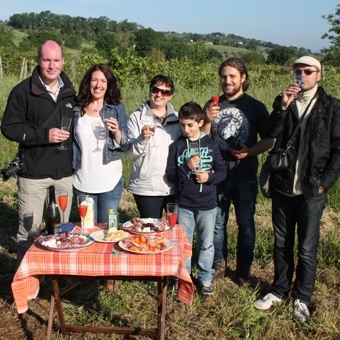 While the balloon is packed away we move on to enjoy a marvellous ballooning Champagne Prosecco breakfast with local tuscan 0km produce, either a picnic on the landing site, or back at the farm. After breakfast we drive back to the launch field. The whole adventure takes about three and a half to four hours. 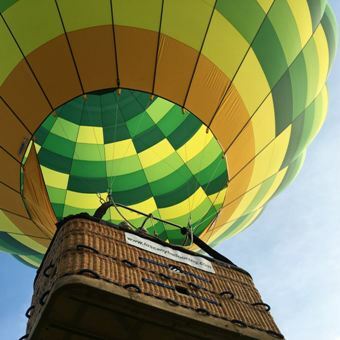 Although we fly all year round, the "ballooning season" is approximately from April to November with annual variations. 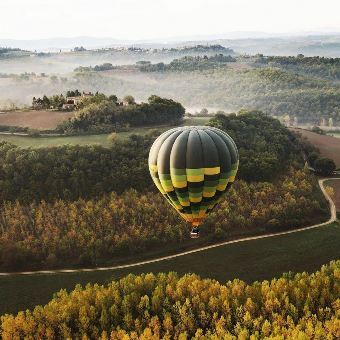 Weather in Chianti can be tricky and unpredictable, especially in early spring; but the months of the summer are regularly good for ballooning. Winter flights can be stunning, with crystal clear views and steady North Easterly winds..
Flights are subject to weather conditions, and for safety we fly only in the calmest of conditions. A flight will be cancelled without hesitation should the weather be unsuitable, the decision to fly is solely at pilot's discretion. Ballooning is a safe and fun activity for people of all ages, but it is an outdoor activity and there are some individuals for whom ballooning may not be appropriate.